If I'm not careful, I'll catch myself writing. I will be swept by the spotlights of my conscious mind, and the hazards of the terrain will be magnified. Second-guessed words, phrases twisted rather than turned. Clichés will loom before me, like serpents in my garden, begging to be used and promising it won't cost me the integrity of my piece. Oh, if only last night hadn't been both dark and stormy. But this is where I surrender. Five sentences. It's all I can manage these days. If I'm not careful, I'll catch myself writing. If I allow my grasp on my pen to falter, or if I stop to correct my initial misspelling of the word falter, or, after that, the word misspelling, I will slow to a crawl, knee deep in the quicksand of my consciousness. Another word I loath to spell in ink, another landmine. And is land mine supposed to be one word or two? Questions like that will get me caught for sure. And I can't afford to lose time or ground now. I'm getting out of this lockup today. Better to lighten my load, drop pesky weights like attention to grammar or spell check, and keep to the hopeful trail I've only this moment uncovered. It's a sliver of space between angry trees and bushes sprouting man-eating flowers, the kind with melon-pink blooms as big as VW Bugs. The flowers smell like rotted meat, perhaps the decomposing remains of other would-be writers who slowed long enough to reconsider using such a violent metaphor, or else turned back to improve it, thinking the phrases "rotted meat" and "decomposing remains" didn't go far enough. As much as I want to scribble "gangrenous" in the margin just a few lines back, I know it will cost me my life, and today it's not worth it. Today I keep running, and the tongues of the big, vicious blooms loll on the jungle floor and lap at the flicker of my running ankles. A single word hurtles through the branches, perforating the enormous green leaves, and slams into my temple. Flicker. And I'm down on my knees again, blood pounding in my veins. I feel heavy. Flicker. Of all the words I overuse in my writing (and there are many) the one that pops up most often is Flicker. Flicker and Flutter. Overused words, evidence of my dwindling vocabulary. I could have thought up a better word, I think as my palms slip in the mud and my hair swings into my face. But I doubt myself even now, for I've stopped, you see, and I'm going over that moment again and again, trying to find that better word so I can move on, but it isn't coming to me, and I'm sitting dumbfounded on the trail just waiting for the hounds to find my lily white throat. What would a real writer do? Succumb to the inflicted self-torment of listing her own shortcomings? Become distracted by the snort and snuffle of a fellow café patron blowing his nose? Close her book and reach for the cinnamon roll? 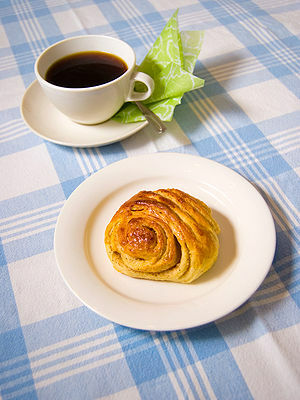 The cinnamon roll is plump and oblong, as if the flaking swirl of pastry can hardly contain the flavor. It is crusted with sugar and baked to a specifically delectable shade of gold. Sunlight breaks through the glass dish beside it, one holding a spoonful of scarlet raspberry preserves, and sends dazzling patterns across the table. I'm moving again, sidestepping the doubts that litter my path. This time, when I can't think of another, better word for "doubts," I don't stop to try and jumpstart my internal thesaurus. It's either working for me or it's not. I can't afford any more delays. There is barbed wire to cut; there are guard towers to dodge, dogs to outrun. This metaphor is getting out of hand. I can feel the rubber of the steering wheel burn against my flesh, and then the smell rises in echo. But what's worse? Ditching the metaphor that's been working for me where nothing else has? Or continuing without control? As it turns out, what's actually worse is Secret Danger C: Caring that I've lost control of my metaphor, admitting that my writerly hands are too small or that the wheel is too big. Secret Danger C can only lead to the nastiest of all pitfalls: Comparing myself to other writers. Better writers. Writers who, I'm certain, would never drop two colons in the same paragraph without a courtesy third or fourth sentence between them to soften the blow. Writers who can spell courtesy right the first time. In a game like that, I can't win. I've stacked the deck against myself. I've read more than enough to recognize good writing when I see it, and what has trembled blue behind my pen for the last half an hour ain't it. So, best not to look back. Forward progress is the way out of this jungle. Write every day, even if it's lousy, even if it's stilted and rigid and has all been done before. Write every day. Drink lots of water. Sit next to someone who will smile are you every now and again, who will smile at you even when you can't seem to locate the transition out of a paragraph because it is graceless and sentimental. Look for that smile, insert some white space, and move on. And for the love of all that is well written in this world, stop counting sentences. Who cares if you quit after 5 of 500? So long as you promise to kneel at the foot of the God of Ink and Inspiration tomorrow, too, who cares? Not I. Life moves too fast and in too many directions to be recorded by any single pen. An army of Thinkers, Poets, Observers, Dreamers, and Optimists is required to get even a fragment of it down on the page. Even if my contribution is a mere 5 sentences a day, there's a good chance it will be 5 sentences that would have been otherwise lost to the void of missed opportunities. Even those 5 sentences can be valuable. I live in a city of noise and color unlike any I've known, and it's time for me to emerge from the jungle haven I've created for myself and dare to write down what I see. Even when it's difficult. Even when my wrist and fingers cramp. Even when I'm about to lose the last perfect bit of cinnamon roll to my hungry husband. That's the sacrifice I must be willing to make, daily, for an art I'm bound to pursue. Only then can I say that writing is my vocation.